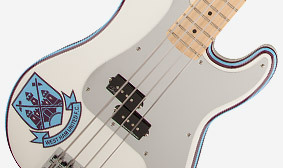 Steve Harris's galloping fleet-fingered basslines have turbocharged U.K. metal titans Iron Maiden for decades and have made him the most influential metal bassist alive. 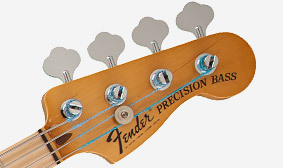 Harris has stayed true to his battle-hardened Precision Bass over the years, and his signature Steve Harris Precision Bass now comes in his famously regal gloss White finish with special pinstriping, mirrored pickguard and West Ham United F.C. crest. Other ironclad features include a single powerful Seymour Duncan® Steve Harris signature model pickup, Fender HiMass™ bridge, Fender round-wound strings and Harris's signature on the back of the headstock. 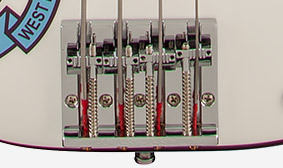 A set of Rotosound® Steve Harris Signature flat-wound strings are included. 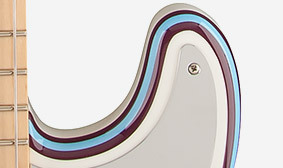 A two-piece body not only imparts a unique cosmetic touch, but is also crafted from dense, articulate maple—perfect for Harris' galloping basslines. The hot coil wind behind Harris' signature Seymour Duncan® SPB-4 pickup serves up pure powerhouse tone with increased mids and tight treble. The pristine gloss White finish on the body is flanked with pinstripes for an added dose of attitude on any stage. 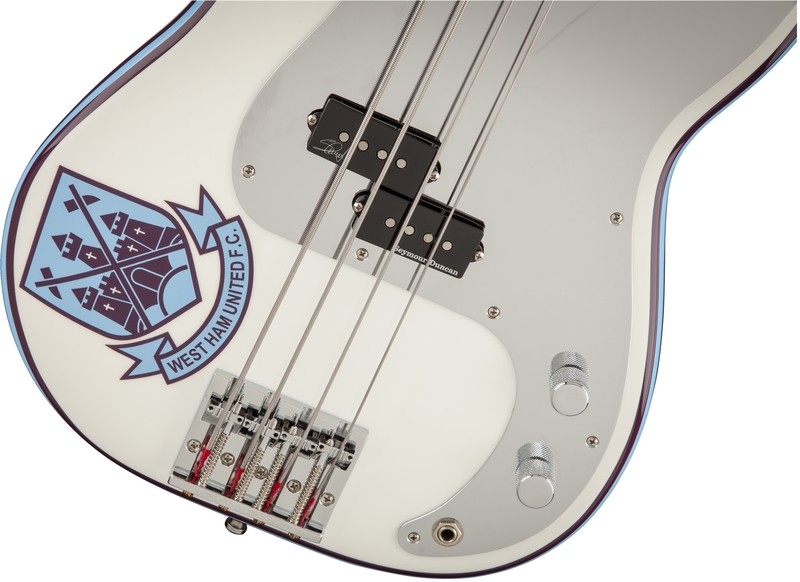 A devoted West Ham United football fan, Harris decked out this signature instrument with the official logo of his favorite team. For an added touch of personal style, the instrument sports a dark tinted headstock complete with the signature of the Maiden bassist. 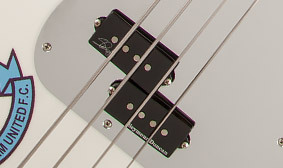 Achieve rock-solid sustain and pure P Bass® resonance with a sleek and stable High-Mass bridge. Pinstriped Body with Westham United F.C. Crest, Dunlop® 6100 Frets, Black Synthetic Bone Nut, Darker Tint on Headstock, Rotosound® Steve Harris Signature flatwound strings included.